In the vicious Sengoku (or Warring States) Period of feudal Japan, numerous bloodthirsty generals fought in an endless struggle for power, but one man proved supreme; the Dark Lord Oda. Joining forces in spite of their bitter rivalry, two young warriors, Sanada and Date, must form an unlikely alliance with the other generals in order to bring down the fearsome and decidedly ruthless Demon King. 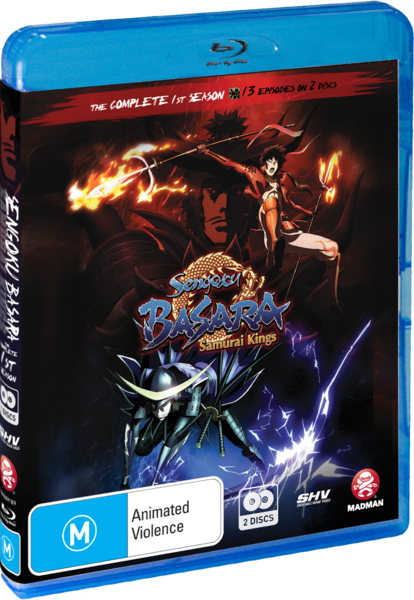 Numerous anime series’ draw their inspiration from feudal lore, classical texts and tales of epic conquest; few do so with such panache as Sengoku Basara. Its hyperreal aesthetic works perfectly within the context of an animated epic, with story arcs, plotlines and uniquely eccentric characters given plenty of time to cross paths, usually with swords drawn. Impossibly bloody battles, one-eyed dragons, murderous generals, vengeful armies... oh, and let’s not forget a Demon King. It’s all par for the course for this elegant, devilishly energetic animated outing, and the end result is a stunningly crafted HD action-fest that barely gives you time to blink, let alone catch your breath. Visually the series is sumptuous, multifaceted and arresting from start to finish, with endlessly inventive character designs and expertly staged action sequences, something of a plus considering the characters spend a large proportion of their time attempting to hack each other to pieces. These visual strengths are hardly surprising given that the studio at the helm, Production I.G., have been responsible for some of the most cutting edge anime of the last few years, including Ghost in the Shell, Blood: The Last Vampire and the excellent if oft-overlooked Ghost Hound, reviewed elsewhere on these pages. The visuals are matched by a faultless Dolby TrueHD 5.1 English Master audio, and a ballsy, perfectly respectable Japanese TrueHD 2.0. The aspect ratio is an anamorphically enhanced 16:9 widescreen, which is how we like to get down around these here parts, and the English subs are error-free. Nothing to fault whatsoever on the audio or video front; the series looks and sounds perfect on Blu. The Region B release features over 45 minutes of bonus content all of which is, like the feature itself, presented in 1080p HD. Scattered amongst the usual trailers and textless openings are a couple of worthwhile titbits, though the two-disc Blu-ray edition doesn’t exactly excel in this regard. Still, with Series One running almost five and a half hours you still get plenty of bang for your buck.